Couldn’t resist these two daredevils living on the edge. 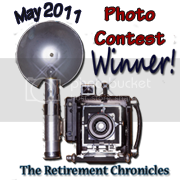 Visit Camera Critters to see many great photos! Since I have Thunder, an English Setter, I of course am attracted to anything with hunting dogs. Make it vintage and I am especially happy. This English Setter decanter we found in an antique store while on vacation, several years ago. I was thrilled to find it. This first embroidered scene I found on Ebay. This embroidered pointers scene has been in my cedar chest for as long as I can remember. I finally framed it a couple of years ago. My mother actually embroidered it when she was very young. So not only is it a great vintage piece of artwork that I love, it was also made by my mom. I wonder if she knew back then, that her daughter and her husband would one day have hunting dogs. Besides Thunder, we also had his mother~ Scooter, another English Setter, and before her, we had a German Shorthair, Spot. My husband used to bird hunt with them. They were all great hunters in their day as well as great dogs. 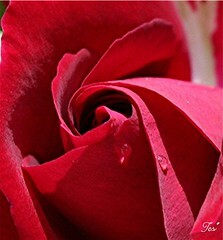 I hope you are having a wonderful Thursday! 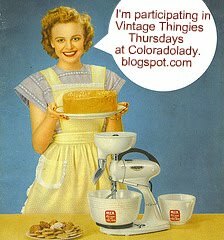 Visit Colorado Lady and see more vintage goodies.